Samsung’s top of the line flagships are the ones that manage to gather the most amount of spotlight for the company. But the company has a variety of other devices under its portfolio as well that cater to the needs of those requiring decent performance at a budget. After all, not all of us need smartphones capable of putting old supercomputers to shame. The Korean manufacturer’s venture into metal territory was marked by the Galaxy A series, and today we’ve manged to uncover some more information about the Galaxy A8. In a boat load of leak sources out there, GeekBench proves to be one of the most accurate out there, given that the device posted on the benchmark site is the correct variant. The Samsung Galaxy A8 has made an appearance on GeekBench, and now we get to take a detailed look at what the device can be expected to offer. 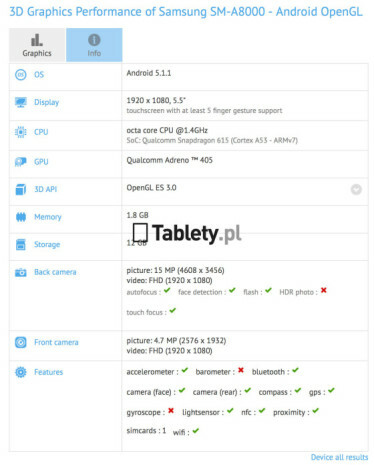 According to the posting, the Galaxy A8 can be expected to come with Qualcomm’s Snapdragon 615 on board. This will be supplemented with 2 GB of RAM and 16 GB of internal storage, specifications which can be expected of any device in its category. For photography lovers, the Galaxy A8 will also be coming with a 16 MP rear camera and a 5MP front camera according to today’s information. Screen resolution for its 5.5 inch screen will stand at 1920 x 1080p. Other specifications for the device include a reasonable 3,050 mAh battery and a metal frame measuring 5.9 mm thin, making the A8 one of the thinnest devices out there. Given the rate of progress that the Galaxy A8 appears to have achieved according to the listing, we can expect the device to be with us soon. So stay tuned to stay updated and let us know what you think in the comments section.